We believe in our products and we know you will love them, too. Our software support team is available to assist you and will generally reply to any concern within 24 hours. If, however, they are unable to resolve your technical issues we will offer a full refund, within 30 days of purchase. In the unlikely event that you experience any difficulties whatsoever with Credit Aid, our support team wants to hear from you. The software has been triple quality assurance checked at every level. It is being used and enjoyed by thousands of happy customers. We are confident that it is stable and will function trouble free on any computer running windows 7, Vista or XP. Buy with Confidence! Refunds are based on Software failure, not general dissatisfaction or lack of features. Refunds are provided only after our technical support team has assisted in your installation and the Software fails to function fully according to the technical team diagnosis. We will determine if a refund is necessary based on individual situations. Refunds are not available after 30 days from purchase date. Misunderstanding use of the Software. Purchasing Software for use on an unsupported operating system (*including Mac). Unwanted Software upon or after Purchase. Other, where the request for refund is not based upon a defect or bug discovered which cannot be corrected/resolved. Requests made outside of the 30 day window. If your request for a refund falls under any of the criteria above, a refund will only be given at Credit-Aid Software’s discretion, and will incur a 15% Administration Charge. 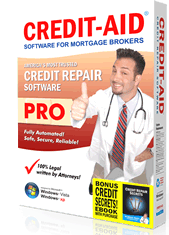 Please note that Credit-Aid Software’s Titles are available on a try-before-buy basis as “Free Demo” versions. We clearly post links to "free demos" and "video tour" on nearly every page of our web site, because we encourage all users to download and evaluate all software before purchase. *Credit-Aid Software is "designed for Windows 7, Vista or XP." This information is displayed on the top of every page in our site. Credit-Aid will not run on a any other operating system -- including MAC (unless you are running Windows 7, Vista or XP on an emulator program). Credit-Aid is distributed with a single computer license that is non-transferrable and may be installed on only one (1) computer. Links to this information are displayed on every page in our web site. It is also displayed and agreed to during product installation as part of the End User License Agreement.